The graphic shows an abstract overview of our setup. On the bottom left we have one of our plant nodes which communicates with the Eclipse Californium Server via the CoAP protocol, both of which have been introduced here. To develop the web interface we have chosen the Play framework because it runs inside the JVM and thus integrates well with Californium. 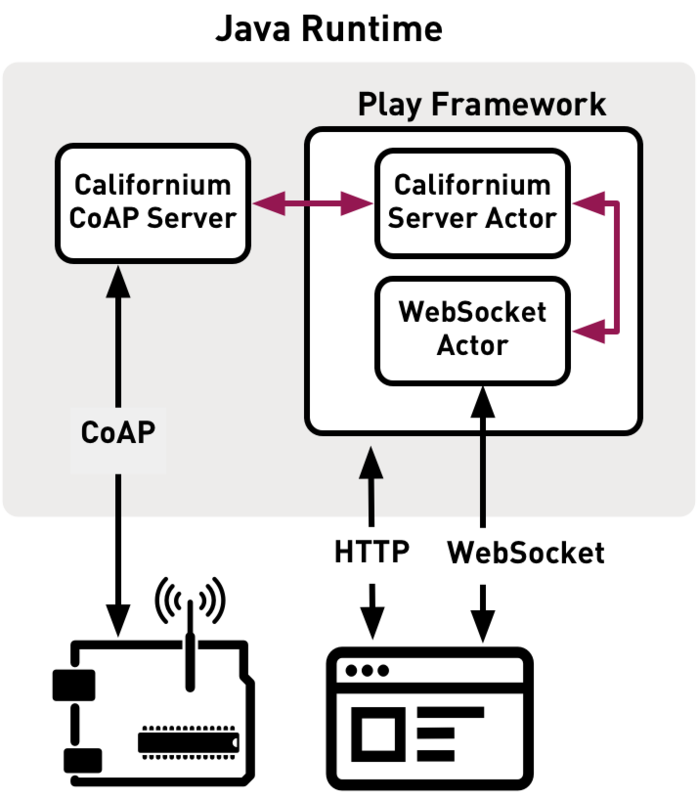 The communication between the Californium Server and the web application is established through an Akka Actor, which is the conventional solution for asynchronous communication within Play. Lastly, the user’s browser communicates with the Play application server using HTTP as well as the WebSocket protocol for “realtime” updates. Communication between actors is highlighted in red. No protocol is mentioned because no serialization of the messages is necessary, since the subsystems operate inside the same Java Virtual Machine, thus making it possible to simply pass Java objects around. In order to create a new Play application, Java has to be installed on your system. Please follow the guide on playframework.com on how to install the Play framework itself. After the installation you’re ready to create a new Play app. Since this article does not intend to be an introduction to the Play framework, only the necessary steps are shown here. 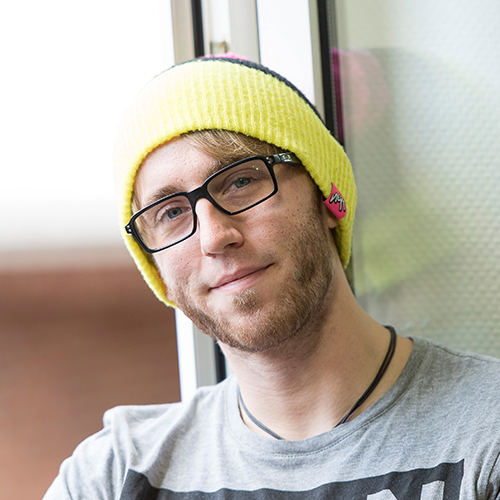 For more details check out the framework’s getting started guide. Note: While Play offers the option for development in Scala, this blogpost relies entirely on an implementation written in Java, in the the hope that a Java implementation reaches a wider audience. Most parts should be easily interchangeable with Scala code, however. This will create a new directory play-californium in the current directory, to which we can switch and execute ./activator run. This will start a webserver at port 9000, so navigating to http://localhost:9000 should display the Play welcome message. Note: Play automatically detects changes in the project directory after each request to the webserver, so it is not necessary to restart it after source code changes. libraryDependencies += "org.eclipse.californium" % "californium-core" % "1.0.0-M3"
Note: The above statement has to be surrounded by newlines or an error will be thrown. This is a convention of the Scala Build Tool (SBT) which is used by Play. After adding said line and re-running ./activator, the dependency should now be included in the project. If 1.0.0-M3 should not be the current release of californium-core then you will have to update the last segment of the above dependency to match the current version designation. Background jobs in Play are executed through so-called “Actors”, which are lightweight concurrent entities which process messages asynchronously (docs.akka.io provides a much more detailed explanation). We will use such an actor to handle creation and graceful shutdown of our Californium CoAP server. 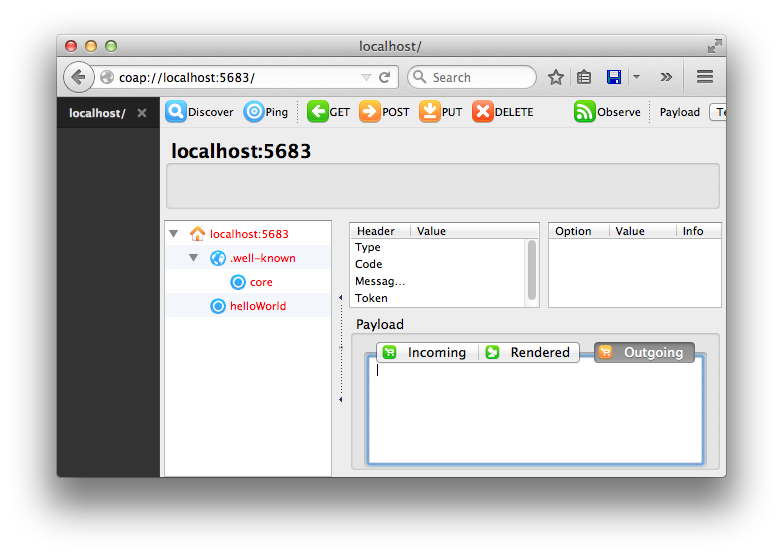 Additionally it will handle communication between the CoAP server and the rest of the Play application. There are several types of actors, but we will be working with the simplest, the UntypedActor. The server variable will hold a reference to the instantiated Californium server, which is initialized in the constructor. The implementation of said server is presented in the next section. Here we pass a reference to the actor, obtained by calling getSelf and of type ActorRef, as a parameter to the Californium initialization routine. We do this so that the Californium server will be able to send messages to the Californium actor and thus to the Play application. One thing to note is the ShutdownActor case. In it, we first call server.stop() to shutdown the Californium server. In the following line we send a PoisonPill message to the current actor. This is a message provided by the Akka actor framework which instructs the actor to process all messages remaining in its inbox and then shut itself down. In the onStart method we create an instance of our Californium Server Actor and store the reference for later access. In onStop we send it a ShutdownActor message to gracefully shutdown the Californium server as well as itself. For a more in-depth explanation of how the Play integration of Akka works please refer to the Play documentation. For this guide we have slightly modified the official Californium Hello World Server. The following section highlights our modifications. For the full class please refer to GitHub. Lastly we define said resource as an inner class of the CaliforniumServer. The constructor of the CoapResource takes the resource name as a parameter, which in this case is helloWorld. In order to send messages to the resource we still need to define a handler for one of the CoAP methods (GET, POST, PUT and DELETE). We don’t use GET (as the Californium HelloWorld example does) because it cannot have a payload. In the handlePUT method we notify the server actor that a message has been received through a CoapMessageReceived instance containing the message’s paylod. The second parameter of tell is the sending actor. Since we’re not in an actor context and do not need to receive a response from the actor, we can simply pass null. Lastly we respond with the CHANGED response code which indicates that the request was successful but did not result in the creation of a new resource. Now let’s test what we’ve built. In the Play project’s root directory, launch ./activator run (if it isn’t still running) and navigate to http://localhost:9000. This will initialize the Californium server and the actors, thus allowing us to receive CoAP messages. The last step we’ll have to take is to get our application deployed to Raspberry. This is relatively simple if you’ve set it up according to our previous post, “”, because Java comes pre-installed on recent releases of Raspbian. Note: If you’re deploying to a device that has e.g. Java 7 installed, but you built the application with Java 8, running it on the target will fail. To circumvent this, add the following to your build.sbt if necessary: javacOptions ++= Seq("-source", "1.7", "-target", "1.7"). This sets the Java compiler’s target version to Java 7. After that you should be able to test the Californium Server inside Play just as you’ve done locally, by entering the IP of your Raspberry into Firefox with the coap:// protocol prefix. An upcoming post will explain how to forward the CoAP messages to the user’s browser through WebSockets and how to process CoAP messages and update a web interface in “realtime” based on the received data.